It is one of our last nights before a new year and before we must going back to the city and to work. The end of the year or a vacation always puts me in mind of “What’s Next?”. What is next at work? What’s on the social calendar? What new things will I learn? What things do I never want to think of again? And what things do I want to stay just as they are? 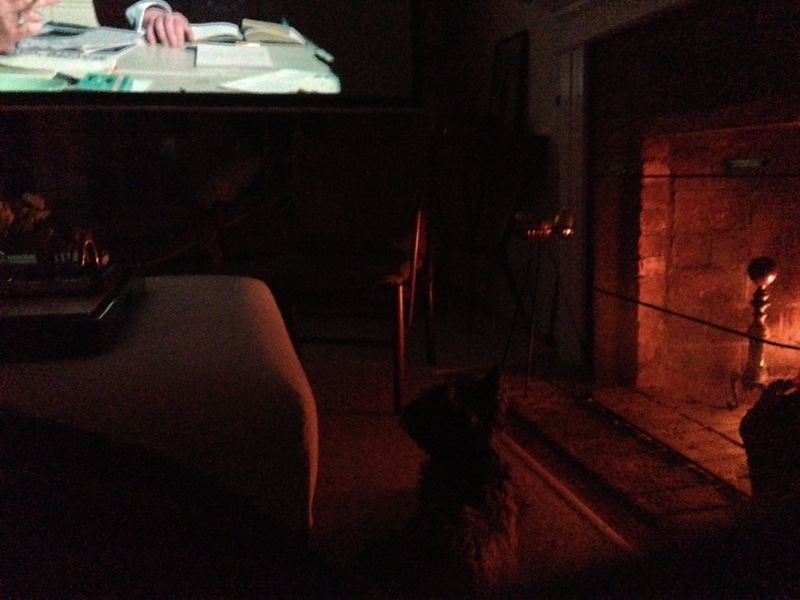 At any rate, tonight his attention was a tad torn, since A-dog also loves watching the fire. So he was sort of watching it while watching The Hour* with careful body positioning. Got to love a dog who manages to make it all work, even when he is pulled in different directions. Perhaps that will be one of my New Things to Try in 2013. * Have you been watching The Hour? It is on the BBC and it is pretty good. Less dramatic than Mad Men, and also less beautifully directed, but still a good one. Do you like Mr. H’s Christmas Stockings? I certainly did. And the toasty fire made our Christmas morning quite cozy, which was a great start to a lovely holiday. I hope you had a good one, too. And now that it is all over, we are in the midst of winding down for the year. Mostly I hope to sleep, read, sleep, go to the gym without “squeezing it in”, eat and did I mention sleeping? Well, that is the plan. How did I ever find this unappealing as a child? Maybe because it had “fruit cake” connotations? Or perhaps I was just stubborn. Whatever. A friend brought one to our place a few years ago and I am completely addicted to them now. Lovely with a cup of tea or as an indulgent breakfast. And you can get them this time of year in many places. My go-tos are BKLYN Larder (http://bklynlarder.com) and Zingerman’s (https://www.zingermans.com…and no, I do not work for them). Yum. I see that I have gotten off the topic, which is Winding Down…whoops! My first it to meditate more seriously. I have everything I need to meditate: the floor and myself. And you don’t even need a ton of time to meditate, but I can fill up a day so quickly that it is super easy to skip it. And, like moisturizing at night, I really should not skip it. When I meditate regularly, I find my overall reactions to things are much more measured and I am less easily flustered and overwhelmed, putting this in the Very Worthwhile file. So, I am going to try to spend less time reading mindless headlines on the internet and such, and reallocate it to a decent practice. Fingers crossed. But Baby Steps are sometimes all it takes to make big changes in life. So, I am stepping and shall see where I wind up. In a final flurry of Pre-Holiday Socializing, I met up with my friend who is a Make-up Artist…let’s call her Ms B. I usually try very hard not to pepper her with questions about how to look perfect on her nights off, but one bottle of wine in and all bets were off. So I asked the one question that has been weighing on me: Should I give the old pencil eye liner a try? (I know, we tackle the Big Issues here.) Ms B gave me an unqualified “YES!”, and told me the one to try was the darkest one I could find by Urban Decay (http://www.urbandecay.com), and to use a push brush* to do the necessary smudging. I ordered two shades that evening: a really dark brown and a fierce black. Today I tried the brown since it is daytime and I am at the beach, so I wanted to at least approach the Naturally Fresh and Lovely look. And I have to tell you, this stuff goes on smooth, is easy to smudge until the desired smudginess has been achieved and then kind of “dries” and stays put. Needless to say, I am impressed and bow down to Ms B for sharing her secrets. 3) Urban Decay Beauty Balm: This came with my eye pencils and I am not sure that it is released just yet, but I tried it today and I really like it! Not at all greasy, but goes on smoothly and has a broad spectrum SPF, which from what I hear, is a good thing. And that is all I have for today, but that feels like enough, right? * That is the stubby little brush that comes with all those kits of brushes you see. Also, have you washed your make-up brushes lately? Just a little reminder in case you haven’t. At first I didn’t think it was appropriate to write about Sandy Hook, but it also seems wrong not to say something. I don’t think I am alone in not being able to get my mind around “why?” and feeling extremely sad. I suppose the best we can hope for is for peace for the families and genuine action in our country. I don’t think people who own guns are “bad”, but I do think one needs to decide whether the freedom to possess certain things is more important than the safety of the community at large. Hopefully now will be the time that we all start thinking about these choices and start making some positive ones. I love this movie. LOVE IT! Katherine Hepburn, Spencer Tracey and The Electronic Brain (also known as EMERAC). It isn’t about the holidays, but enough of it takes place during that time of year so that it feels right. My favorite scene is the dinner at Hepburn’s apartment, which is completely cozy and strangely chic. And without this film, I would never be able to ask Mr. H “How do you like your chicken fried?” when we obviously can’t understand a word either of us are saying. (Just watch it and that will all make sense.) Adorable and fun. And you can refer to your computer as “The Electronic Brain” for at least 24 hours after viewing before people get annoyed with you. What can I say? This one reeks of Christmas and Simpler Times and The Goodness of People — an explosion of horse-drawn coaches, kittens, quilts, snow and flowers. And Marmee is played by Susan Sarandon, who was pretty much The Best Marmee Ever. Have I mentioned that Christian Bale is in it? Yes, he is, which provides a decent enough distraction from Winona Ryder, who, let’s face it, tends to be flat. Then there is the Beth Death Scene, which is wonderfully sappy and leads perfectly into the happy ending. For the ladies, only, I think. And make sure you have a nice, soft hankie. True, it makes no sense but it is cheery and has “Christmas” in the title. And I really love singing along when the girls do their “Sisters” number. I really do. I know what you are thinking: What?? Well, all I can say is that I love this movie and will take any excuse to watch it. Aside from the insanity of it all, I love the amazing apartment, every single Rosemary Woodhouse outfit and the fact that this appears to have been made in a serious manner without anyone thinking that the plot is completely nuts. Campy good fun. You know why. And I believe it to be an American Classic. Well, we are nearing the Finish Line for The Holidays. And while I wish I would have actually made some latkes and jelly donuts this week, I think that I may just buy some and enjoy them before the week is out. * That was a little bit of Holiday Wisdom that has served me well these last few weeks: Do it up, but be reasonable and don’t cut out the fun. For the record, I am now dying to do a powder room in prints like these…we’ll save that for 2013, I suppose. I know people have funny feelings about Joy, but I find it to be very handy, especially for Straight Up things. And as I have said before, there is nothing in an Ina Garten cookbook that doesn’t turn out perfectly, and Alice Waters is Alice Waters. So, with the help of these three books, I have planned a festive meal that has tons to make ahead and very little that you can mess up. Festive but Foolproof: another key to Happier Holidays. And to make sure things stay festive throughout our week off, I’ve also ordered all the goodies needed for New Year’s Eve and the days in between. Reservations at our favorite places by the beach have been secured and I have a rather massive reading and watching list to get through. I am also hoping to get to the new and undisputed massive new Parrish Museum. (http://www.parrishart.org) The building alone is should make it intriguing enough, but the exhibitions could be promising as well…we shall see. And that is probably the final bit of Holiday Wisdom I have for this evening: Plans should go with the flow. This isn’t a military operation, it is meant to be fun, so if things get a little off course, no biggie. You’ve done the work, now is the time to just enjoy. * In fact, I just ordered the latkes with the fixings from Russ & Daughters…now we just need the donuts. And yes, I am not actually Jewish, but I still like Chanukah and any reason to celebrate. You are currently viewing the archives for December, 2012 at Some Cozy Night.